Tomorrow is Christmas, so let's review a jolly fat man and his weird little magical helper. Mojo is the ruler of the Mojoverse, a world where everyone is spineless and addicted to television. The X-Men are often abducted to star in his programming. Spineless and addicted to television? Sometimes the Donald Trump jokes write themselves! 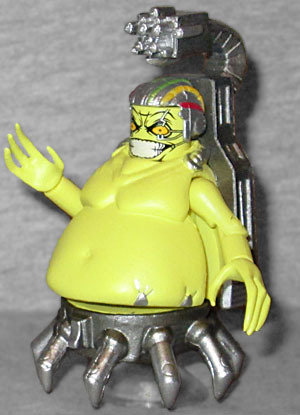 Mojo is such a big Minimate that not only does he have to be disassembled in the packaging, the front of the blister also had to be specially molded to make room for him, something we haven't seen since Samhain! Although there is a standard Minimate torso deep inside the body, we can't see any of it: the bulbous body and the back of his chair cover it entirely. The wires on his head are a separate piece, and his face is printed with a terrific rictus grin. He has long, spindly fingers, and although the set includes a small stand that plugs into the bottom of his chair, you don't need it to keep the figure sturdy. No longer stuntwoman "Ricochet" Rita Wayword, the techno-enhanced Spiral now works for Mojo, bringing targets to the Mojoverse and modifying them in her "Body Shoppe." That's right, Spiral was once a human stuntwoman - so hurry the eff up, Marvel, and put her in an X-Men movie so you can cast Zoe Bell in the role! Spiral uses the same add-on piece as Six-Armed Spider-Man since she, like him, has six arms. All three arms on the right side appear to be normal skin, while only one on the left is: one over there is fully metal, and the other is metal from the elbow down. 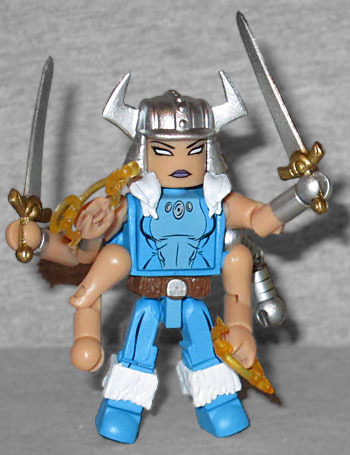 Her helmet and hair are a single new piece, and her torso is painted with a light stripe blue down the center and thin black lines for anatomy. She has fur on her boots, and her accessories include two swords and two spellcasting hands, cast for the first time in yellow rather than red or pink. This set really goes above and beyond the usual Minimates, and is a very cool offering.